During this period of the Cold war and Falklands war the Irish Sea was nicknamed ‘Submarine Highway’. Many fishermen lost their lives due to submarines getting caught in their nets. In many cases the submarines did not submerge to save those on the trawlers, but continued to dive so as not to reveal their position. This is what happened in the case of The Sharelga. The crew which consisted of skipper Raymond McAvoy, his brother Billy McAvoy, his Uncle Noel Kirwin, brother in law Micky Kelly and non-family member Gabriel Hesnan set off to fish for prawns in April 1982. Their boat suddenly stalled and was dragged backwards. Within fifteen minutes the boat had capsized and the men almost drowned. Only that the incident occurred during the day, the sea was calm and there were other boats in the area at the time, the men believe they would have lost their lives. Luckily however all five crew members survived the incident and it was for that reason the illegal activities of submarines in the Irish Sea was highlighted. They were rescued by other boats in the vicinity but had lost their livelihood in a matter of minutes. 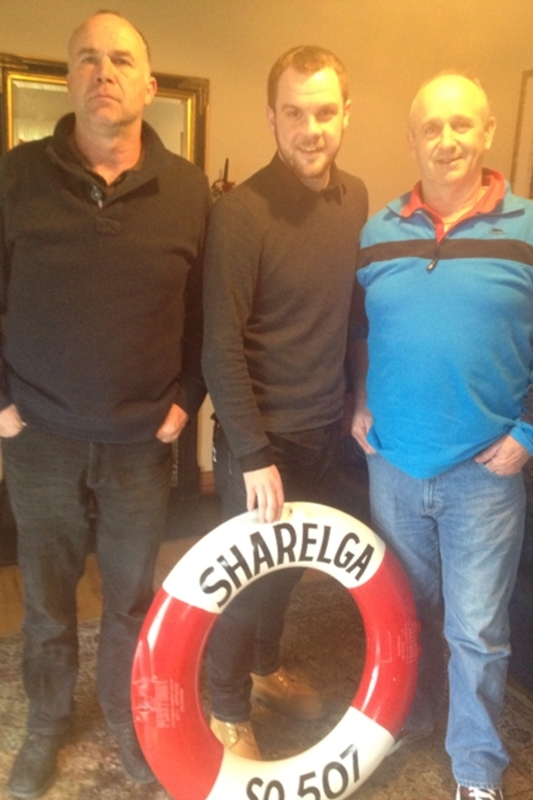 The photo features l-r Gabriel Hesnan, documentary maker Mark Hogan and skipper Raymond McAvoy on the right with the life ring that was used during the incident. The sinking of the Sharelga caused financial devastation for the crew and thirty years on they remain bitter at how they were treated by both the Irish and British governments. It took almost two weeks for the British Navy to admit liability and four years later the crew received compensation in a Belfast court. The compensation however as Raymond McAvoy puts it “didn’t even match half of what he paid for the boat”. The documentary features the crew of the Sharelga, skipper Raymond’s wife Barbara McAvoy, Naval affairs expert Pat Sweeney and ex Finanna Fáil TD Hugh Byrne who raised the issue in the Dáil on many occasions. Submarine Highway will open people’s eyes in to what was going on beneath the Irish Sea during this period. As people got on with their daily lives a new danger lay in the ocean for our fishermen. A nuclear accident was also waiting to happen as submarines from Britain, the USA, Russia and other nations staked each other out under the surface. Submarine Highway was made and produced by Mike Hogan. This entry was posted in Uncategorized and tagged The Sharelga on December 12, 2012 by jasonlockley.